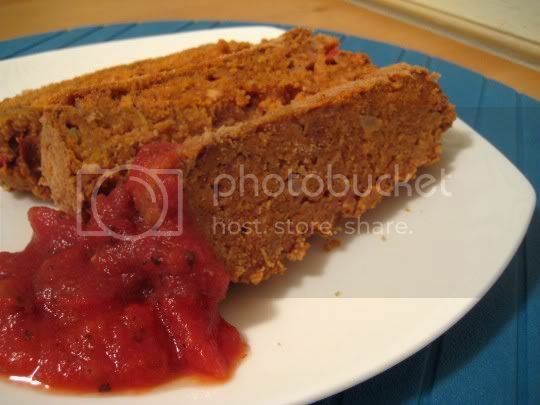 This is an interesting take on meatloaf... It is far from even posing as a meat substitute, but it holds its own and is super filling. The taste though is surprisingly good. It's savory and rich, with a hint of sweetness. It's also extremely easy to make: grind almonds in a blender, and add chopped onions, bread crumbs, eggs, and marinara sauce. Press the mixture (it will be stiff) into a loaf pan, bake, and you're done. You get a crusty, bread-like, thick and dense concotion that's great with ketchup and mustard, spaghetti sauce, or barbecue sauce. It's probably the texture that will throw most people off, as this is sort of like a dried-out savory bread pudding, and not juicy and meaty like a real meatloaf. I'd suggest adding some extra seasoning to make this more meatloaf-like: oregano, pepper, maybe a little garlic and worcestershire sauce. Still, the flavor will keep you eating more and more, and this is even the type of dish that's good for a cold, late-night snack. Serve with veggies for a more balanced meal. Or use a slice in a sandwich on toasted bread with melted cheese, tomato, and mustard. Might as well be meatloaf! Make again? As easy as it was and with so few ingredients, a definite plus.